Earlier after MGR's death there wasn't anyone experienced leader with vision to lead the AIADMK party, so this made things easy for DMK, but unexpectedly Janaki MGR was elected and she was replaced by Jayalalitha by some crooked way which DMK didn't expect and they tried their level best bring her down which made her more stubborn and made sure none rise above her till date and controls the party with her iron fists. Accordingly both are very clear about making use of Tamilnadu people gullible and swindle government wealth and stay in power. Meanwhile between Jayalalitha and Karunanidhi, the face of Tamilnadu politics became a coin. 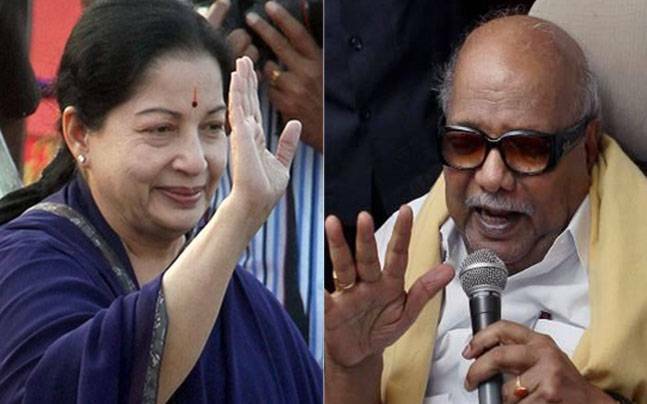 Furthermore each party represented their side vociferously when in power, while the other was in shadows, but between both of them, the politics of Tamilnadu was encapsulated. Moreover nothing was out of these parties purview they fought against each other, they matched each other, tried to outbid each other. Further one side of the coin (Jayalalitha) was disturbed, we have to now wait and see, if there is going to be a continuation of the same representation in Stalin vs. Edappadi or Stalin vs. Pannerselvam, which ever battle emerges, where no one can even match the intensity of Karunanidhi vs. Jayalalitha.